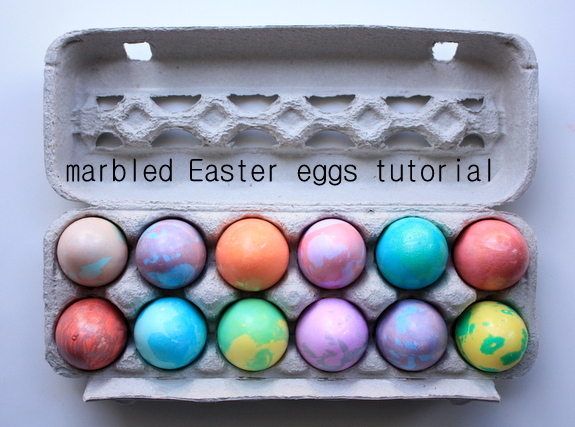 So friends, today we learn how to make marbled Easter eggs. They’re so easy and fun, and my kids went nuts dyeing them over the weekend. Whip up a dozen or so for your Easter celebrations just to show who’s the boss of crafting in your world. Here’s how the whole marbled Easter eggs thing goes down. You only need a few more supplies than usual to marble your eggs and it’s only one extra step. Trust me though, it isn’t a complicated one or I wouldn’t have done it. You know how I like it: simple, easy, no fuss. 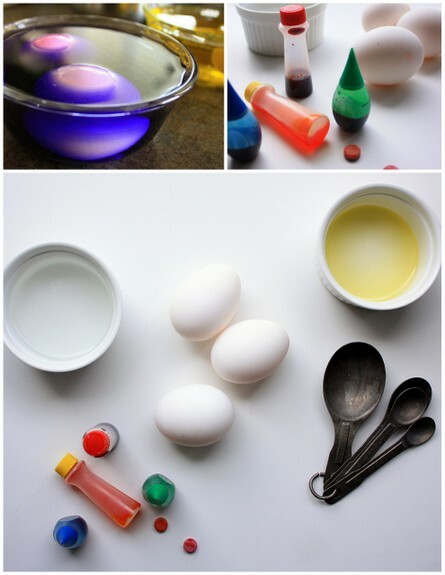 If you don’t have food coloring, just use the regular dye tablets that come in any Easter egg kit. Prepare the dye baths by filling a small deep bowl with a cup of water and a tablet (or 20 drops of food coloring) and 3 Tablespoons white vinegar. 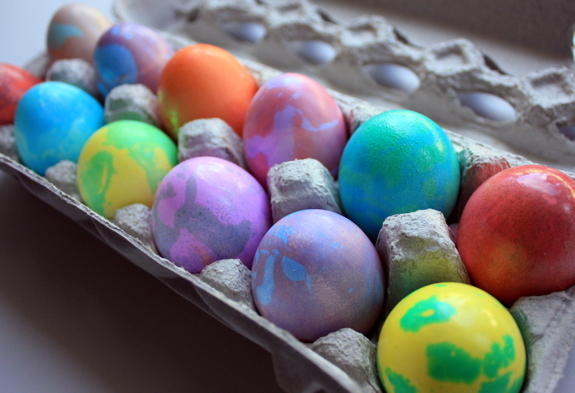 Put your hard boiled (or blown out) eggs into the baths until you get the colors you want. Light pastel colors work well for a base coat before you get to marbling. Pull the eggs out of the baths and dry them on paper towels, repeating until you’ve dyed all the eggs you’re going to marble. In some shallow bowls create new darker egg baths, only this time use about 2 cups of water. Add the food coloring and vinegar, but this time add about a tablespoon of vegetable oil. (We used olive oil) Use a flatter, shallow bowl so the liquid isn’t more than a couple of inches deep. Using a fork, mix up the olive oil and immediately put an egg into the oil + dye mix. Roll the egg around for a few seconds and pull it out when you like the way it looks, then dry on a towel. Put it back into the egg carton while it dries, giving it at least 2 hours until the color sets in perfectly. 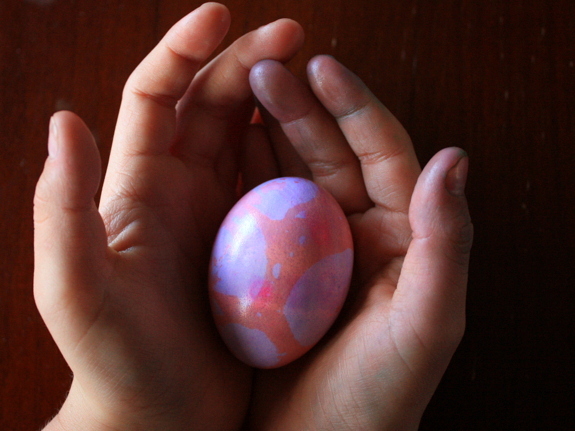 We loved marbling our Easter eggs so much we’re going to do it to at least a dozen eggs from here on out. Now go forth and dye! fun idea! My kids would LOVE it. Those look awesome. I’m gonna have to do that, looks so simple too! !